I took this photograph this morning from Bernal Hill, a little earlier than I would normally be awake because the dog I’m sitting for (Hi, Ace!) demands it. I’ve been up to the hill a bunch of times, and the view is still striking. I’ve lived in San Francisco for a little over a year now, but I’m still frequently getting asked how I’m enjoying it. It’s a very different city from the last few places I’ve lived. But my most common answer (unless I’m very frustrated with something at the moment) is that it’s so easy here to surround yourself with beautiful scenery. 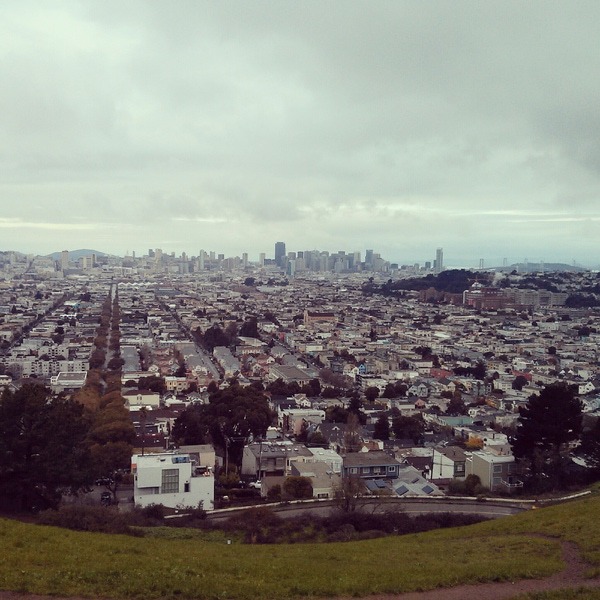 From this spot on Bernal Hill, you can see from the Candlestick Park and the freeway interchanges all the way across downtown and Bay Bridge to the Golden Gate, way out on the north tip of the peninsula. It’s quite a place, this city.